It makes good sense to lower your home’s temperature setting during the hours when you are away at work or on vacation. After all, there’s no need to heat an empty home. Lowering the thermostat is a good way to reduce fuel use and ease heating costs. But be careful! Lowering the temperature too far can result in damage to your heating system. You want to keep the “cool” temperature at a level that keeps your home’s pipes from freezing, and also makes it easy for your heating unit to “catch up” to your preferred temperature once you return. Our recommendation? Keep the “bottom end” of your temperature range no more than 5°F lower than your “comfortable” temperature when you will be returning in the evening. For example, if you like to keep your home at 70°F when you are home, set it no lower than 65°F while you are away. Any lower and you run the risk of not being able to fully warm your home without putting undue strain on your system and burning more fuel than you saved in the first place. If you are going to be away for an extended period, either on vacation or in Florida for the winter months, you can maintain your home’s temperature at a slighter cooler level. However, we strongly recommend that you do not allow the interior temperature to fall below 55°F. This will help avoid damage that can occur with freezing pipes. This “floor” temperature is especially important when outside temperatures fall far below freezing, into the arctic cold range. 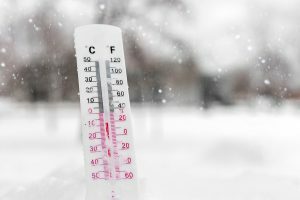 Extreme exterior cold makes your heating system work harder than normal, so it is essential to maintain your home’s interior at a minimum of at least 55°F. One more caution: If you have a “smart” thermostat that learns your preferences and adjusts automatically, make sure its lower setting does not drop below these recommendations. Questions about the ideal temperature for your home? Call the home comfort experts at Alvin Hollis at (781) 335-2100.